Huntsville Home Sales within the metro area for the month of July have improved for the 5th straight month and have come in seasonably strong. On the revenue side of the equation, results were relatively flat month-to-month with July sales revenues of $72,935,257 up 0.2% above June’s results. However when looking on the transaction side, sales increased to 339 closings up a solid 3% from June. 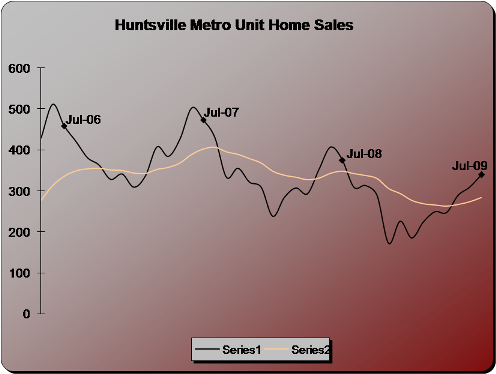 Looking at the following 4 year Huntsville Home Sales chart, it is quite easy to surmise that July is typically the seasonal month where transactions begin their seasonal decline.Thus given that typical seasonable behavior generally sees a small decrease in homes sales during July this month’s performance is especially good news. Looking at Huntsville Home Sales year-over-year July’s sales figures are significant, because the slower year-over-year sales gap we have been monitoring has been averaging 25% lower than 2008′s results. This months sales deficiency when compared with July 2008 greatly improved this shortfall trend to only -9.4%. If July’s results are repeatable and extend into the fall, we may very well be able to call a bottom in our local real estate market and would anticipate a more stable market throughout 2010. One of the attributes of our current market that continues to concern us, is the dynamic price range mix of sold homes month-to-month. The Huntsville Real Estate Market lagged the rest of the nation as the national mortgage crisis took its toll and foreclosure homes began to dominate local markets, though late to the game Huntsville is now experiencing an increase in foreclosure sales and they have begun to effect our local market results month-to-month. We follow this phenomenon closing in our monthly home price articles so be sure to keep a close eye on these posts. We have also enhanced our internal property search engine to ease the search of local foreclosure homes so be sure to check a few of them out while you’re searching properties on the website.